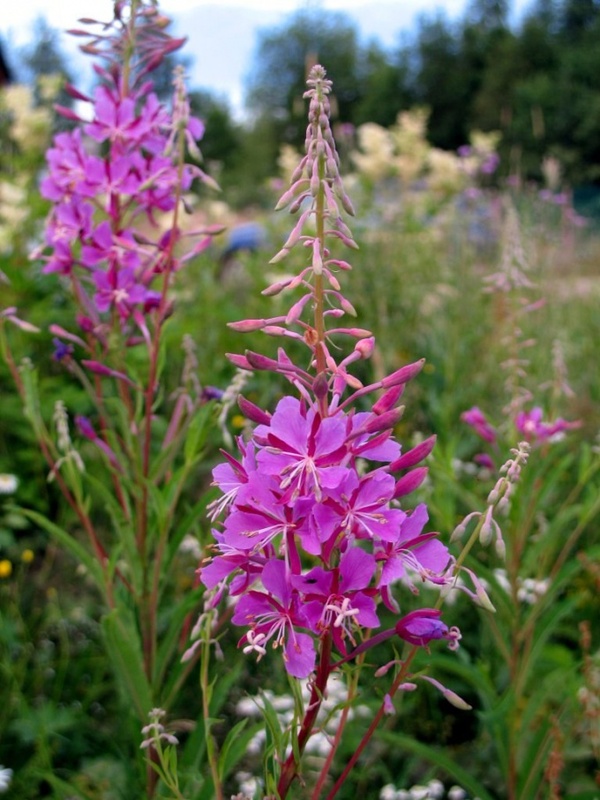 Fireweed is a perennial herbaceous plant that has excellent pink-purple inflorescences. A few years ago, people used its leaves as leaves for tea, but after a while new technologies make this drink replaced the medicinal plants. Some doctors prescribe to patients tincture made out of the Ivan-tea, because it has soothing and anti-inflammatory effect. But before moving on to the workpiece, it is necessary to collect this plant. First of all you should know when to collect fireweed. The collection time depends on the region. For example, in the southern part of Russia the mass flowering of this plant occurs in late June or early July; in the North – in the 20s of July. Tea will suit you leaves. If you want to prepare kipany honey, you need flowers. In any case, it is not necessary to pull out fireweed with root, better cut the stem in the middle so you keep the root system and next year will be able to come to the edge of the forest and to gather medicinal plants. You ask, where grows the willow-herb? To answer this question, you should know that he loves the sun, so it grows in open Sunny areas, edges. Ivan tea blossoms, it can grow on vacant places formed after a fire and the felling of the forest zone. Here near the water plant not to look, as it absolutely does not tolerate wet soil and air. There are several varieties of the willow. For example, forest willow to use is not necessary, as its application may adversely affect human health. But how to distinguish? Yes, elementary. Just look at the appearance of the plant. Ivan-tea is a relatively high plant-from 70 cm to 200 cm, while the fireweed reaches only 15 cm. Suppose you have collected the leaves of fireweed. What's next? Now you must do the leaves are limp, place them in a dry place, that is to lay a newspaper and tip them. Try to avoid drying out the plants. Then roll up the sheets into tubes, put in an enamel pan with a layer of 5 cm, cover with a slightly damp cloth and store overnight in a warm place. In the morning remove Mature willow-herb and finely chop. Vysypite plant on a baking sheet and within the hour, dry in the oven at low temperature. Welding for tea ready. The benefits of a willow-herb said a lot, respectful comments on its medicinal properties and Fedor Konyukhov (known traveler and a loner). Their sea journey he takes with him Koporye tea to maintain strength, because the restorative properties of willow-herb is known since ancient times. 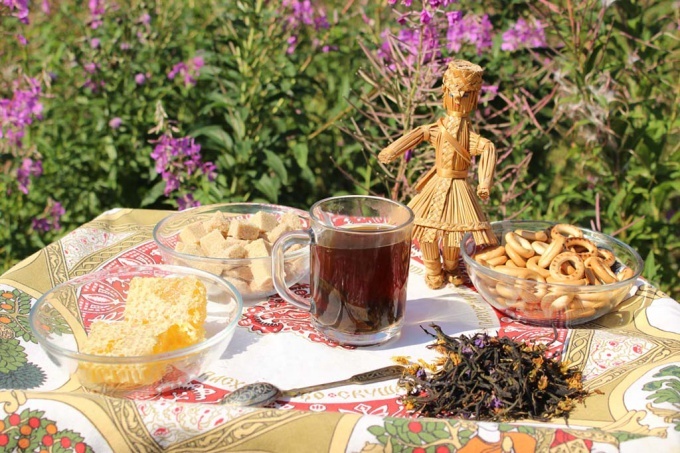 Taste and aroma of the Koporye tea is directly dependent on techniques of collection and preparation, and they, in turn, have many nuances. Fireweed grows in open, dry areas. It lit glades, edges and felling. The exact flowering time of plants is difficult to determine because it depends on climate, habitats, and weather conditions. If in the South of Russia gathering fireweed begins approximately in the last days of June and lasts until mid-July in the Northern regions, the fireweed blooms from July to August and then to September. To collect fireweed is not in the city and next to the road slopes. For this approach only ecologically clean place. Gathering fireweed spend the early morning in dry weather when they are flowering. Desirable to collect the leaves and blossoms after the rain, as the plant should be dry. Collect the leaves by swiping on the stem hand down. You need to leave the stalk on the lower leaves, since they will be very rude for harvesting tea. Under the peduncle remains three rows of leaves for further plant growth and root development. This method of collecting Ivan-tea will not hurt the growth of the plant. Separately collected inflorescences. The collected leaves Ivan-tea washed and placed on a cloth or paper layer at 5 centimeters, periodically digging. In this condition they are left for twenty-four hours, avoiding direct sunlight. When the leaves will become limp, they will be easier to process, and excess moisture in them will interfere with the conduct fermentation. Fermentation is the process of fermentation of fresh leaves, which gives the herbs a special smell and properties. Due to fermentation will be maintained and augmented nutrients, and the finished tea will acquire a unique taste. Leaves Ivan-tea is taken for a small party, slipping his hands in the form of sausages. Appeared juice indicates that the violation occurred in the cellular structure sheet, which will lead to the occurrence of oxidation processes. The finished sheets are stacked in an enamel or stainless steel tank with a layer of 3-5 cm and the top covered with a wet cloth. The container is in a warm place at a temperature of 27 degrees for twelve hours. If the temperature increase, the process of maturation is faster. He will be considered complete when the smell of the grass will change to floral-fruity fragrance. Sheets that have passed fermentation, are cut finely and spread out on a baking sheet, covered with parchment, a layer of half an inch. Dry willow-herb takes place at a temperature a hundred degrees, for about an hour. The oven must be kept ajar. Then the temperature was lowered to fifty degrees and the tea is dried until the final moisture output. During the drying process the sheet is preferably not overdry. If performed correctly, the requirements, the tea will be black, the leaves will break rather than crumble down. In violation of instructions from fermented Ivan-tea will be the smell as from burned paper. Flowers Ivan-tea to dry separately from the leaves, as the temperature of fermentation of tea about 100 degrees, and they will burn. It is enough for them to dry at a temperature of fifty degrees. Further the dried flowers can be stored along with the leaves. This will give Ivan a Cup of tea unique taste and delicate aroma. Keep fireweed in dry, dark place in glass boxes with tightly closed with plastic lids. It strongly absorbs odors, so it is undesirable tea to be stored with strong-smelling products. Fireweed has one feature – the longer it is stored, the taste is better.